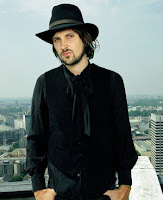 Kasabian's Serge Pizzorno has said that he wants to "put rock 'n' roll to the sword" on the band's new album. He and his bandmates are currently working on the follow-up to their last album 'Velociraptor!' and, in an interview with MTV, he said of his plans for the new material: "I want to put rock 'n' roll to the sword - I'm looking for the future sound of rock. I love guitars but I wanna destroy guitars as well." He went on to add: "Don't worry, I'm not talking about going on the dubstep wagon. I just want to harness the power of when you go to see The Prodigy, The Chemical Brothers or Rage Against The Machine and you leave reborn. When the album turns on you won't ever want to stop it - that's what I want." Earlier this month, lead singer Tom Meighan also spoke about progress on the LP and said: "It's like The Prodigy's dirty remix thing. It's cool and it's got really heavy drums - it sounds electrocuted." Kasabian released their fourth studio album 'Velociraptor!' in September last year. They are set to headline Hard Rock Calling on June 29, with support from The Cribs, Paul Weller, Miles Kane, Klaxons, Tribes and Kodaline.